Editor’s note: this piece contains descriptions of bodily harm caused by vehicles crashing into humans as well as a video of a car crashing into a group of pedestrians and bicylists. On April 10, a driver (in what police suspect to be a white Porsche) drove his car into 22-year-old Frederick “Woon” Frazier, killing the young Los Angeles resident near the intersection of Normandie and West Manchester. Photo by Sahra Sulaiman. Above: mourners gather to lament the loss of their friend and the tragedy that followed. Frazier [pictured right] was hit hard and fast from behind just blocks from his home. The loss of the young man to LA’s biking community can never be filled again—and that prompted his many friends and acquaintances to gather the following day at the intersection to protest the death, partially blocked off by police and surrounded by news crews. The protest was not just to mourn their friend’s loss of life but to bring attention to South LA’s growing pedestrian and bicyclist deaths-by-drivers. The intersection at which Frazier was killed is notoriously car-centric: industrialized, lacking safe places for pedestrians to walk, wide for vehicular travle, it is built for “the privileging of speedy passage,” in the words of Sulaiman. Woon’s friends saw this, know this, and felt his death could have been prevented were our streets designed in a way that accommodates all forms of travel. Of course, not everyone sees it that way, even in the face of a pointless death—including a female driver in a gold Toyota Avalon, who soon became agitated at the memorial occurring over what she felt was her and her car’s space, pushing her car into the crowd despite police directing traffic to move away from the intersection. 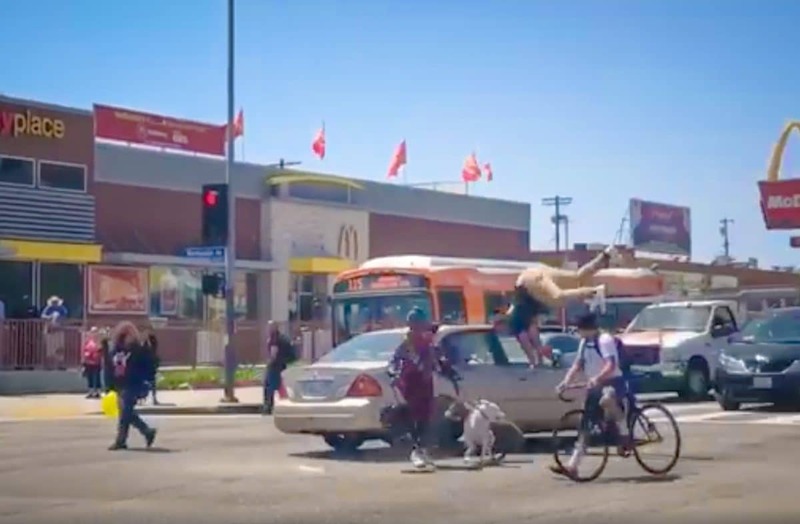 According to KTLA, who also filmed the final moments of the incident, the driver stepped out of the car and got into an altercation with the crowd of mourners. It was then the woman got back into the car and left the scene, only to return later, run a red light at deathly speeds, and crash into the group. She directly hit 24-year-old Quatrell Stallings, who is now mending his wounds. This all occurred in front of the mourners, news crews, and a sergeant in a police car, who was apparently trying to direct traffic around the protest. That officer, LAPD Sergeant Rafael Ramirez, stumbled upon the protest, trying to get them to disband. This caused an uproar amongst the protesters, with some even resorting to violence and slamming the police vehicle. The sergeant then circled the intersection, lights on and sirens wailing, trying to clear the roadway. It was when the SUV came to a stop that the Toyota raced through the red light, striking the crowd. Given the amount of pedestrians, the sergeant had no way of safely pursuing the suspect. As Los Angeles and Long Beach both seen upticks in pedestrian/bicyclist-related deaths and injuries —in one of the more recent local incidentsa 13-year-old girl and 12-year-old boy, both siblings, were struck while riding their bikes in East Long Beach—the need for Vision Zero policies are becoming an essential part of the advocacy discussion. The Vision Zero project is simple: to achieve a highway and arterial system with no fatalities or serious injuries in road traffic. It started in Sweden and was approved by their parliament in October 1997. Sweden has since cut their traffic fatalities dramatically even as the number of vehicle miles traveled has increased. Editor’s note: this article originally excluded the name and details of Quatrell Stallings, both of which have been added.